The SMU Mustangs play in a horseshoe-shaped stadium, which may explain why the team has been so lame in recent years. This season the 0-10 Mustangs are two losses from a Bottom Ten title and the cherished prize that comes with it: a cheddar-cheese sculpture of Ryan Leaf being sacked. SMU, the only winless major college in the U.S., seems down to the challenge. But the big test may come when SMU plays U Conn't (2-8) on Dec. 6. First, of course, the Mustangs must lose to Houston Friday. One SMU site said there are 1,723 tickets available "from $6." However, we understand that the school is actually willing to pay spectators as much as $10 to attend. 9. Iowa State (2-8).... 31-34, Texas Tech...........W. Va. Crummy Game of the Week: Kent State (1-9) vs. vanishing Buffalo (4-6). 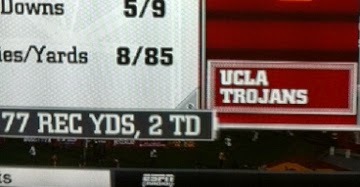 Now it can be told: Several days before UCLA routed SC, 38-20, reader Jill Stewart Sanford noticed that an ESPN graphic predicted that the Bruins would not only win but would take prisoners (see photo above). True, the Jets were routed, 3-38, by Buffalo to seize the Bottom Ten lead. But the good news for any Jets fans who attended was that tickets were free for the game, which was played in Detroit because of snow problems in Buffalo. That worked so well that NFL officials are said to be looking into the possibility of making all tickets to Jets games free. Funny thing is, the Jets would be vastly improved if they could find a decent QB_someone like, oh, say, Mark Sanchez, who has had three straight 300-yard games. But enough about wins and losses. Let's talk about the really important things_the post-touchdown celebrations. 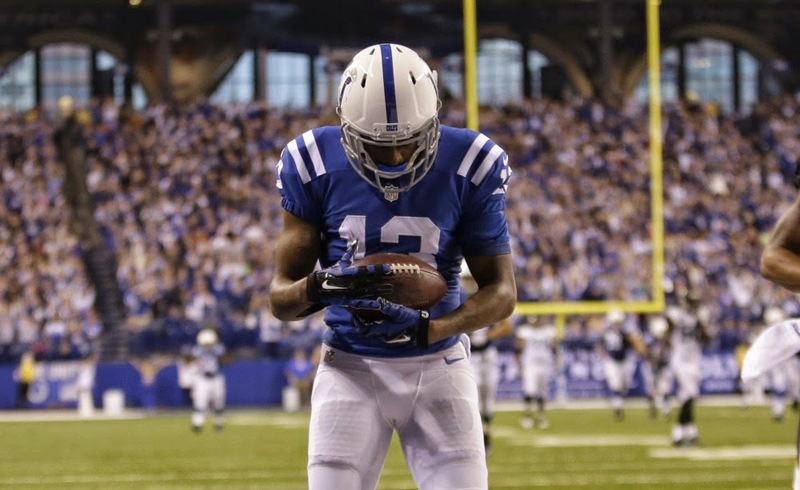 First, there was Indy receiver T.Y. Hilton tenderly holding a football in the end zone in honor of his daughter's birth earlier that day. Then there was Buffalo receiver Scott Chandler mimicking a shoveling motion in the end zone to thank those Bills fans who traveled all the way to Detroit. Either that, or Chandler was demonstrating how the Bills were burying the Jets. 6. Grampa Bay (2-9); 7. N.J. Giants (3-8); 8. Tennessee (2-9); 9. Carolina (3-7-1); 10. Philadelphia 76ers (0-14). Rout of the Week: Indy (7-4) over Washington (3-8). Crummy Game of the Week: Jax (1-10) vs. N.J. Giants (3-8). Mr. MVP: Going into 2014, Atlanta running back Steven Jackson has played on 10 straight non-winning teams. This year Atlanta is 4-7. No. 11, coming up!